Did you know? 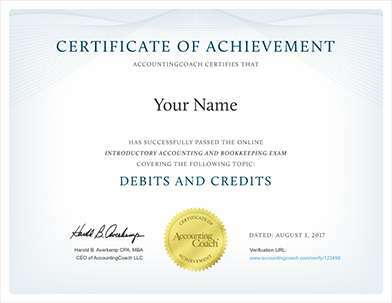 To make the topic of Inventory and Cost of Goods Sold even easier to understand, we created a collection of premium materials called AccountingCoach PRO. Our PRO users get lifetime access to our inventory and cost of goods sold cheat sheet, flashcards, quick tests, business forms, and more. Inventory is merchandise purchased by merchandisers (retailers, wholesalers, distributors) for the purpose of being sold to customers. The cost of the merchandise purchased but not yet sold is reported in the account Inventory or Merchandise Inventory. Inventory is reported as a current asset on the company's balance sheet. 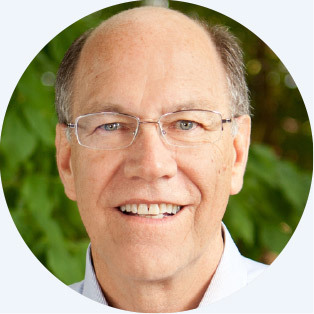 Inventory is a significant asset that needs to be monitored closely. Too much inventory can result in cash flow problems, additional expenses (e.g., storage, insurance), and losses if the items become obsolete. Too little inventory can result in lost sales and lost customers. Because of the cost principle, inventory is reported on the balance sheet at the amount paid to obtain (purchase) the merchandise, not at its selling price. Inventory is also a significant asset of manufacturers. However, in order to simplify our explanation, we will focus on a retailer. Cost of goods sold is the cost of the merchandise that was sold to customers. The cost of goods sold is reported on the income statement when the sales revenues of the goods sold are reported. A retailer's cost of goods sold includes the cost from its supplier plus any additional costs necessary to get the merchandise into inventory and ready for sale. For example, let's assume that Corner Shelf Bookstore purchases a college textbook from a publisher. If Corner Shelf's cost from the publisher is $80 for the textbook plus $5 in shipping costs, Corner Shelf reports $85 in its Inventory account until the book is sold. When the book is sold, the $85 is removed from inventory and is reported as cost of goods sold on the income statement. If the publisher increases the selling prices of its books, the bookstore will have a higher cost for the next book it purchases from the publisher. Any books in the bookstore's inventory will continue to be reported at their cost when purchased. For example, if the Corner Shelf Bookstore has on its shelf a book that had a cost of $85, Corner Shelf will continue to report the cost of that one book at its actual cost of $85 even if the same book now has a cost of $90. The cost principle will not allow an amount higher than cost to be included in inventory. Let's assume the Corner Shelf Bookstore had one book in inventory at the start of the year 2018 and at different times during 2018 purchased four identical books. During the year 2018 the cost of these books increased due to a paper shortage. The following chart shows the costs of the five books that have to be accounted for. It also assumes that none of the books has been sold as of December 31, 2018. If the Corner Shelf Bookstore sells only one of the five books, which cost should Corner Shelf report as the cost of goods sold? Should it select $85, $87, $89, $89, $90, or an average of the five amounts? A related question is which cost should Corner Shelf report as inventory on its balance sheet for the four books that have not been sold? Note that these are cost flow assumptions. This means that the order in which costs are removed from inventory can be different from the order in which the goods are physically removed from inventory. 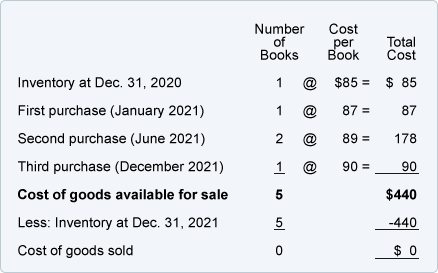 In other words, Corner Shelf could sell the book that was on hand at December 31, 2017 but could remove from inventory the $90 cost of the book purchased in December 2018 (if it elects the LIFO cost flow assumption).